The full-service laundry company that DELIVERS. We offer the complete services for all your laundry needs. From laundry to pick-up and delivery, storage, renting and inventory management. Our laundry facility provides state-of-the-art cleaning to all of your garments regardless of the environment in which they are used daily. Offering a statewide delivery service, we are able to ensure a fast turnaround of your laundry on a regular basis. We are a family owned Tasmanian business dedicated to meeting the needs of our clientele – from small businesses to large organisations. 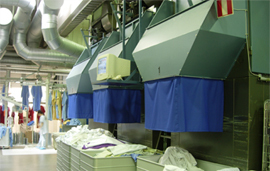 We provide workwear laundry services for a large-range of industrial, corporate, hospitality, medical and other businesses. We provide options for both hired goods and customer own goods (COG). Laundry King is a Tasmanian owned and operated commercial laundry, catering to a wide range of clientele including Small Businesses, Large Companies, Government, Non-Profit Organizations. We work with clients across a large number of industries including; Hospitality, Health & Hospitals, Manufacturing, Automotive, Corporate, Accommodation, Education, Retail and more.